Jerry Shulman Produce is an exclusive importer of U.S. #1 carrots grown by the largest carrot growers in Israel, including DOROT Field Crops located on Kibbutz DOROT near Ashkelon, Israel. Through the winning combination of pristine growing conditions and state-of-the-art agriculture technology, this carrot crop is in high demand on a global scale. These carrots undergo a rigorous and methodical seven stage process of rinsing, inspection and cleaning that concludes with the carrots being given the stamp of quality. DOROT is the largest exporter of fresh carrots; they are GAP certified, and we are proud to represent their product in the U.S. In addition to DOROT, several of the largest carrot growers in Israel have entrusted us to import their carrots as well, adding to our ability to provide quality carrots to an even bigger customer base during the season running from approx. March-July. Size, quality and taste are superb as the carrots are packed fresh, not from storage, so not only do they look beautiful but they taste great too! “We bought several 5 lb. bags of your carrots at a store called Pricerite, my children really liked them and the boy next door kept asking for more. I'm sure you agree that carrots are one of the best vegetables if they are good… yours are excellent, sweet, juicy and tender; none compare! Thank you for the treat!" "Just a note of thanks! 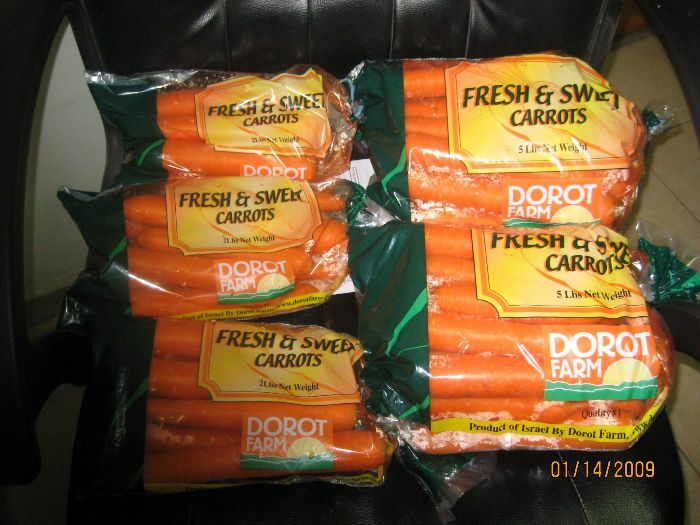 I recently purchased Dorot Carrots at Price Rite in Pittsfield, MA. I use a lot of carrots and I have to say they are the best I've ever purchased. Most similar to, or better than home grown.... I was amazed that such freshness, quality and value comes from half way around the world. I will look for the Dorot brand in the future. Thank you!